With Shine Online Banking, personal financial management is simplified, with spending analysis and budget tools, alerts, eStatements, free credit score access and more. On May 30, Shine Online Banking received a fresh look and new features. Shine Mobile Banking offers a clean and streamlined banking experience from your smartphone with features like mobile deposit, quick balance, Picture Pay, PIN login, and coupons and retail offers. On July 10, Shine Mobile Banking was enhanced with features to fulfill all your mobile banking needs. Via Desktop: Click on the Register link (under the Online Banking login box) on Dupaco's homepage. See our Online Banking FAQs below for additional information about what’s required to register. Via mobile browser: Visit m.dupaco.com, and open the drop-down menu in the upper left corner. Scroll down the menu, select Register, and then complete the necessary fields as you’re prompted. Via Dupaco’s app: Open Shine Mobile Banking on Dupaco’s app. Click on the Register button and complete the necessary fields as you’re prompted. to Shine Mobile Banking using an Apple or Android-powered mobile device through Dupaco's free app. 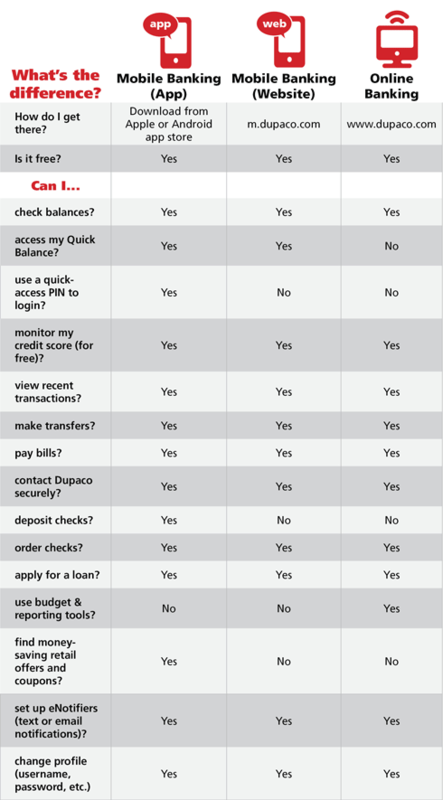 Although you can do many of the same things on Shine Online Banking as in Shine Mobile Banking, there are some differences. For a comparison, see the chart below. How much does it cost to use Shine Online Banking? To begin using Shine Online Banking, you must first complete a short, one-time registration process. To do so, simply go to Dupaco's homepage, and click Sign Up under the login box. Fill in the requested information. Type the word YES to accept, then click Start. Verify your previously entered information, including your Username, then select three Security Questions and Answers. Click Next. Select a Security Phrase and Picture. These will display each time you log in to confirm that you are on Dupaco’s legitimate website. Click Next. Once you’ve registered and logged in to Shine Online Banking, you can update your User Name and Password at any time by clicking the Profile link at the top of the screen. The Profile link also allows you to manage other account settings and options. Is it secure for me to use Shine Online Banking? Dupaco uses the most advanced Internet security systems available for Shine Online Banking. When you enter online banking you are entering a secure area on the Internet, which means all information is encrypted or encoded. The multi-level login procedure is another safeguard against unauthorized users accessing your data—only you will know your user name, password, and security question. In addition, the system records the date and time of the last login attempt. make transfers between your accounts or to other members. You also have the ability to create Quick Transfers, where you have the option to save it for one-touch access in the future if it’s a transfer amount you commonly use, such as a loan payment. Via mobile browser: Go to m.dupaco.com and select the drop-down menu located in the upper left-hand corner. Scroll down and select Register. Then, fill out the on-screen prompts. Via Dupaco’s app: Open Dupaco's app and select Shine Mobile Banking. Then, select Register, which can be found under the login box. Fill out the on-screen prompts. Dupaco app vs. mobile-friendly website: which is right for you? A mobile app is an application that runs on a mobile device (phone, tablet, e-reader, iPod, etc.) that can connect to wifi or wireless carrier networks. The Dupaco Mobile app is only available on Apple and Android-powered devices. All devices with web/internet accessibility can access Dupaco’s mobile website. While accessing Shine through Dupaco's mobile website allows members access to the more day-to-day features of Shine, Dupaco's app offers the user additional benefits such as Picture Pay, mobile deposit, retail offers/coupons and more. Both are completely FREE! To access the Dupaco Mobile app you must be using either an Apple or Android phone or mobile device. To locate the app, simply search the term Dupaco from your app store. Or, from your mobile device, click or scan the QR code above, which will take you to the download page for the Dupaco Mobile app. I tried registering for online banking and it says that it isn't correct, even though I put everything in exactly. How do I register if it's not taking my information that is correct? Hi Jenna, we'll have a member service representative reach out to you and help you get registered. I was ready to pay off my car and make a payment on my credit card but yet again, I am locked out of my account and cannot received help except Mon-Fri when I am working. I am very frustrated and my payments will now be late. This has happened multiple times- I remember my username and password but frequently it reports its wrong so I re-enter and re-enter and then locked out. Looking for suggestions on how to utilize my bank online on the weekend. Hi Kristin, we'll have a member service representative reach out to you to troubleshoot this. Can someone help me setup online payments from another financial institution for my loan? Hi Elizabeth, we'll have a lender reach out to you to get this set up. Thanks! Hi Jennifer, we'll have someone reach out to you here shortly to get your loan payments set up. I did not know that I had to register to set up online banking, is there someone who could email me and help me figure this out? Hi Elizabeth, we'll have a member service representative reach out to you and help you get Shine set up. Hi Lori, Shine should be working now. If you're still having issues, please let us know. Thanks! My online banking is stubborn all the time and I am frustrated! Hi Diana, we're sorry to hear that you're having issues with online banking. We'll have someone from our Technology department reach out to you to troubleshoot. Hi Alyson, we will have a lender reach out to you. Thanks! Hi Charles, you can log into your Shine Online Banking account from the homepage to access your checking account. What is the maximum amount of the check that can be deposit? Hi Louis, there is no maximum amount on checks for mobile deposit. We were told we can make mobile deposits; however, we can ot find how or where to do so. Very frustrated! Hi Judi, we're sorry to hear that you're frustrated with mobile deposit. We'll have someone reach out to you and walk you through the steps. I have tried several times to log-in to view my account and all have failed to reach your site that allows me to ":sign-in". This is very distressing to me. Hi Merilyn, we'll have someone reach out to you to troubleshoot your sign in. Hi Carolyn, we'll have someone reach out to you. Thanks! im looking to change banks how is the online banking is it current like if i use a debt card the money comes right out and shows up on online banking or do you wait a few days before you post the transactions? Hi Trina, with a debit card, if you use your PIN, it posts immediately to the account. If you do a credit transaction, it pends against your account so it reflects in the �œavailable” balance, and you can see the transaction in the pending items on Shine. It posts usually within a couple of days…whenever the merchant posts it. Certain transactions like pay at the pump gas purchases may pend for a different amount and can throw the balance off (example: most pumps hold $1) so you need to watch those so you do not over draw your account. Paying with the PIN will eliminate those issues if your preference is to have items post right away. Do you have plans to allow biometric verification as an alternative to ID + password when logging into the mobile app? Good for security and convenience! Hi Shelby, we appreciate the feature request and will bring it to our technology committee for further review. I agree it would make the sign-in process much quicker! Hi Logan, we looked into the situation and it has been resolved. Thanks! My husband opened up a savings account and HSA account. We are both on the accounts. I already have online banking set up and I want to link the two new accounts so I see them when I log in. How do I do that? Hi Jennelle, linking joint and personal accounts is typically not possible on Shine Online Banking. However, I encourage you to give our Member Service team a call at 800-373-7600 or 563-557-7600, extension 206, to discuss some options. Cannot login to my account online. Forgot password and username. Thank You. Hi Dedra, you can give Dupaco a call at 800-373-7600 or (563) 557-7600, ext. 0; We would be happy to recover your lost username and password. I cannot get my pet name to log in. can I change it? Hi David, You can change your security questions under the profile section once logged into Shine. If you cannot get logged in, you can try the forgot password link. If you're still having issues, please call us at (563)557-7600 or 800-373-7600.
logging on to account ! Re: logging on to account ! Gary, Sometimes this is a browser issue. We'll get in touch shortly to see if we can figure this out! I have tried to log into my online account and it said that it's been blocked due to inactivity. I called the number, and the person didn't hardly offer to help at all. I need to be able to check my balance in my account! Kyle, you can call Dupaco (563) 557-7600 / 800-373-7600 ext. 0 or stop into any branch and ask! Your instructions indicate that I should be able to find the mobile app in my app store--Play Store for me. There are no results for dupaco when I search. Consequently, I have not been able to download. However, from the overall reviews, I'm not sure I want to download it. Hello, I'm sorry to hear you are having trouble finding the Dupaco app. You can find the app by clicking on this link: https://play.google.com/store/apps/detailsid=Fi_Mobile.Dupaco&feature=search_result#t=W251bGwsMSwxLDEsIkZpX01vYmlsZS5EdXBhY28iXQ If you still cannot access the app, please contact me at lhemesath@dupaco.com and I will have our experts get in touch with you. Thanks! Hi Leroy, I apologize for any inconvenience. We'll have someone from our IT department get in touch with you shortly to see what the problem may be. I'm not able to access it keeps telling me that the site is unsecured or that I need to reload. This has been happening for over a week now. I can access the mobile version but I don't like the limited mobile version I need to get on my account like I was able to previously for online banking. Has something changed about online banking that I am unaware of? Hi Lauren, We'll see if our IT department can get this straightened out for you. Someone will be in touch shortly. Thank you! Mobile app does not work on my new phone (Samsung S5), it worked perfect on my old smart phone. I have installed and uninstalled several times. I get the "Dupaco mobile" screen then it crashes. Larry, We will have someone contact you shortly to resolve the issue. Thanks!
. would like to have my paper statement in the mail as I had formerly. Mary, You should still receive a paper statement in the mail unless you have opted to go paperless. If you are not receiving your statements in the mail, call Dupaco at (563) 557-7600/800-373-7600 ext. 206. I too miss ICCU online banking. It was easy to access but I was able to set up my info with Dupaco online banking but I not been able to so. When I logged on with my Username it should have taken me to My Phase and My Picture but not the case/ HELP!! Dupaco online banking is NOT user friendly at all. Cindy, I'm sorry to hear you are having difficulty with Dupaco's Shine online banking. We will have someone contact you asap to see if we can't make it a little easier for you. Thanks for your patience! I miss ICCU online banking. I was able to access Dupaco online banking one time when I registered, but since then have not been able to do so. Rose, We'll have someone get in contact with you to gather a few more details. Thanks for your patience! Find it hard to get in to check my accounts now that you are Dupaco. To be specific I can't get in. Karen, we'll have someone get in touch with you to make sure you can access your accounts online without issue. How can you delete a question that your answer won't go though? Would you care to guess at a few settings updates I can try to get to the shine online banking site from desktop/laptop PC? I've added to Trusted sites, allowed pop ups from the site, allowed some other thing, that I don't recall from the site, but still cannot log into online services to see my accounts from my laptop. Google Chrome - i am able to enter my User ID, but the system times out waiting for a reply. IE - The right pane doesn't even show up Mozilla Firefox - i am able to enter my User ID, but the system times out waiting for a reply. Thanks goodness there is an Android app. Hope to hear from you. Cheers. Is there a windows phone app in development? Sorry Matt, there is no Windows phone app in development at this time.